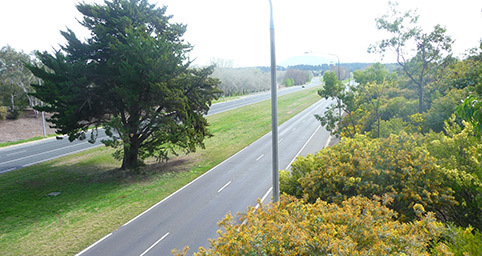 This lone conifer on the Yarra Glen median strip was once part of the Yarra Glen property was were the trees below centre. 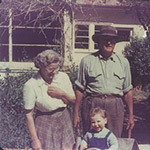 The owners were Nancy and George Campbell photographed here in 1957 with their grandson Alexander. From the Melrose site, drive north on Theodore Street turn right into Carruthers Street. Drive over the Yarra Glen overpass. The sign is on your right on the corner with Groom Street. From the Visitors Centre continue south over Commonwealth Bridge. Take Capital Circle around Parliament House and stay on this road. Take the Carruthers Street exit. Turn left then first right into Groom Street. Yarra Glen was the soldier settlement of George Campbell, a returned serviceman discharged from the AIF in 1919. A descendent of Robert Campbell of Duntroon, he had worked as a jackaroo before the war and had the necessary skill to build a family farm out of the settlement. He was a progressive farmer whose two sons, Robert and Curtis, further developed their widely recognised farming expertise while growing up there. 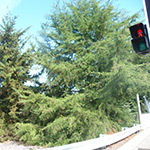 The large conifer in the middle of the median strip of Yarra Glen road, just before the Carruthers Street overpass, and other old pines around the exit ramps, were part of Yarra Glens garden. The Royal Australian Mint stands on a former paddock and Kent Street runs right through the middle of the former property. 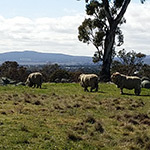 Yarralumla Creek was a great source of water, not only for stock but also for irrigating the lucerne paddock.